The charming Chemex coffee maker brews 3 cups of coffee in one go. All you need is your favourite coffee blend, hot water and Chemex filters. Peter Schlumbom designed the Chemex coffee maker, known for its timeless and beautiful design, in 1941. Chemex was selected as one of the best-designed items of modern times in 1956 by Illinois Institute of Technology, and it belongs to the permanent collections of renowned museums including MoMA and the Smithsonian. Schlumbohm, who had a doctorate in chemistry, took his inspiration from the shape and qualities of laboratory equipment, especially those of the funnel and the Erlenmeyer flask. To the “funnel” he added an air channel and a pouring spout and to the “flask” a small protrusion to mark the midpoint. 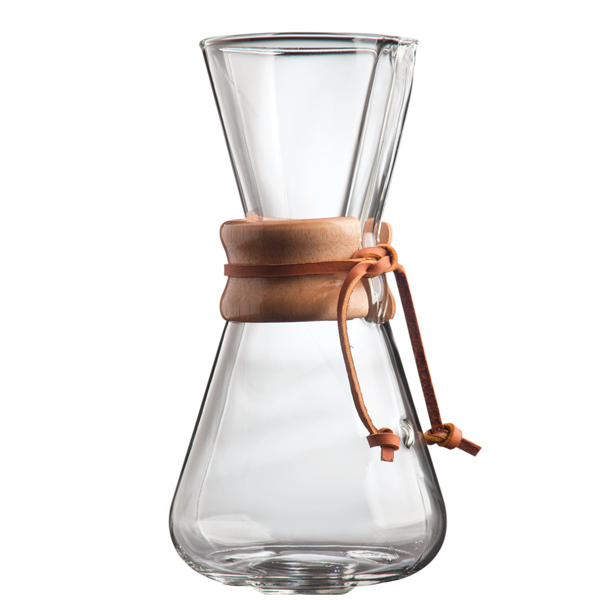 Chemex is made of borosilicate glass that does not absorb odours or chemical residue. The wooden handle with a leather strap is a functional and eye-pleasing detail. 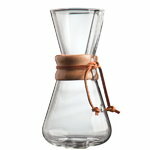 Chemex is an ideal choice for minimalists and coffee aficionados alike. The glass carafe is dishwasher safe.